Already live to those who pre-ordered the shooter before April 29, Blizzard has detailed the start times for the imminent Overwatch beta test. 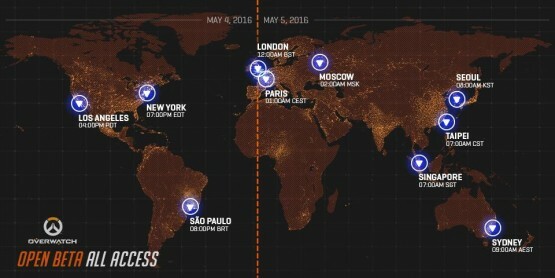 Running from May 4-9 across PlayStation 4, Xbox One and PC, two graphics included below outline when the vertical slice will become available on a region-by-region basis. It’ll weigh in at 11GB on consoles, and around 6.5GB on PC. As for the trailer, it teases some of the shooter action to come, while an official rundown of the content included in this weekend’s beta reveals all 21 heroes will be playable. Overwatch will hit PS4, Xbox One and PC on May 24. For an overview of the beta start times across each region — including the now-active Early Access portion — check out the graphics below.